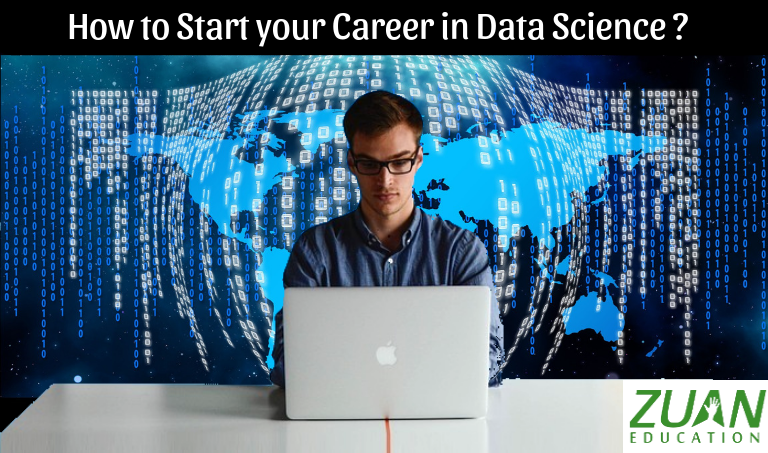 How to Start your Career in Data Science? The economy that you live in is heavily dependent on big data. There is also a demand for data and analytics. And companies need data scientists to read and interpret data. Therefore, big companies need aspiring Data Scientists with Data Science skills. But you may have a question. How to start my career in data science? Well, this article is a prelude to help your effort to be a Data Scientist. What are the essentials you should bear in mind before starting a career in Data Science? Let’s explore. Finally, you communicate the results. Few points to answer your question, how to start my career in data science. You have to remember that you are not alone in asking the question, how to start my career in data science? Data science is a new field and there are many competing for jobs. The role you choose will be dependent on your problem-solving expertise and background. For example, as a software developer, you would feel at ease to work in data engineering. So how to decide which role to take and which skills to upgrade? To solve this issue you can talk to people already in the industry. Like what roles are available and what skills those roles require. Secondly, identify your strengths and match a role with it. Lastly, find a guide who can talk you through choosing apt roles. After you have decided on a role, now its time to learn the skills of the role. What do you do? You can benefit from Massive Open Online Course (MOOC) for learning data science. Therefore, you can take up a Data Science course in edX, Coursera and Udacity. These courses will deal with the programming language, natural language processing etc. Moreover, apart from learning the theory, you should also practice your hands in projects. Furthermore, by doing projects you will practice what you will be creating in your job. Eventually, this will build your portfolio and help gain a better score in the interview. Deciding and preparing for your new role can be a bit haunting. Therefore, you can join peer groups who have the same likes. They should be able to physically interact with you. Or else, you can have a healthy conversation with batch mates on MOOC. Furthermore, you can join in many online forums and technically interact with your peers. You can interact on Analytics Vidhya, StackExchange, and Reddit. While doing courses and training, you have to concentrate on practical applications. How do you do that? Moreover, try working on some open data sets and apply your learning. You may not understand the math. But learn the assumptions, what it does and how to interpret results. Lastly, learn from the solutions made by people who have worked in the field. Read blogs written by influential Data Scientists. These blogs have regular updates on new findings. Moreover, they publish posts on recent advancements in the field. Make such readings a habit. Be cautious to follow only the right resources. This link contains some of the top Data Scientists you can keep a track of. Additionally, you can read newsletters like WildML, NYU, and KDnuggets News. You may think that recruiters won’t look for communication skills for Data Science jobs. This is a myth. Your technical knowledge alone is not adequate. Furthermore, you can develop your skills my talking in front of a friend with communication skills. He will judge you rightly. Good communication skills are mandatory to work in your desired role. Therefore, you cannot take communication skills for granted. To share your ideas in a meeting or with a friend in the corporate circle you need excellent communication skills. You have immense benefits of doing so. Networking opportunities bring you close to people already working in the field. Importantly, it helps to improve your career goals and avenues. Additionally, you will have the advantage of mentorship support. Lastly, you can get tips on job search or may even fetch you a job directly. The above tips will guide you with the answers for the question, how to start my career in data science. Few technical skills to be acquainted to answer your question, how to start my career in data science? Python and R are great choices. Both these languages have a wealth of essentials that help in the Data Science workflow. You need not master both of these languages initially but just try to understand the basic functionalities. Pandas provide high-performance data structure called Data Frame. Your efficiency in working with Data will increase by learning pandas. For machine learning in Python, you should know to use the scikit-learn library. Machine Learning and Deep Learning in depth are pivotal to answer important questions in Data Science. You have to only learn to understand and apply the right algorithms in the right settings. At an entry level, your resume shouldn’t have too many technical jargons. For example data cleaning, data visualization, linear algebra etc. Moreover, reserve them for your senior levels. Your amplification of the projects in the interview will boost your chances of being selected. Data science roles in the job industry are much sought after. In the real world, the amount of time spent on the number of data analytics etc is increasing alarmingly. Therefore, the job options for people trained in data science is in demand. While many cities offer courses in data science, if you are put up in or around Chennai you can learn Data Science course in Chennai from reputed IT institutions. Carefully following the above guidelines will help you launch a successful career in your Data Science journey. And answer your question, how to start my career in data science? The best of success comrades!